Transparency Market Research has released a new market report titled “Automotive Lane Keep Assist System: (By Component: Electronic Control Unit (ECU) and Others ; By Sales Channel: Aftermarket and Others; By Vehicle Type: Passenger Vehicle and Commercial Vehicle; By Region: North America, Europe, Asia Pacific, Latin America, and Middle East & Africa) - Global Industry Analysis, Size, Share, Growth, Trends, and Forecast 2017 - 2025.” According to the report, the global automotive lane keep assist market is expected to expand at a CAGR of 13.76% during the forecast period. Rise in demand for vehicle-based intelligent safety systems among vehicle users is projected to boost the lane keep assist system and adaptive cruise control market for automotive during the forecast period. Increased rate of accidents caused due to distraction of the driver causes damage to both, the vehicle user and vehicle. Lane keep assist system and adaptive cruise control are active safety systems, which prevent the vehicle from drifting into another lane and warn the drivers of the vehicles in front, thereby reducing the chances of accident. A study conducted in the U.S. for 25 states concluded that vehicle safety technologies have reduced severities such as head-on crashes and sideswipes by about 11% and injuries by 21%. These outcomes results in higher incorporation of vehicles with advanced driver assistance system, which in turn is a key factor that is estimated to boost the lane keep assist system and adaptive cruise control market for automotive during the forecast period. A long duration drive become stressful for driver, which can lead to accidents and sometimes fatal injuries too. Lane keep assist system and adaptive cruise control avoids this by maintaining the preset speed of the vehicle and allows the vehicle to remain within the lane. Long route drives and personal safety are key factors that are likely to drive the global lane keep assist system and adaptive cruise control market for automotive during the forecast period. European Union regulations on safety features such as advanced driver assistance system and their implementation in vehicles by 2020 are anticipated to propel the lane keep assist system and adaptive cruise control market for automotive during the forecast period. The radar sensor component segment dominated the lane keep assist system and adaptive cruise control market, by accounting for a prominent share of the revenue. Radar sensor is a key component of the combined safety system, which provides reliable detection and monitors any vehicle or objects that falls within distance. This results in collision avoidance and driver assistance. Radar is responsible for the actions performed by the adaptive cruise control system. Higher cost the components led to increased market share in terms of revenue. In terms of sales channel, the aftermarket segment holds a major share of the market as compared to the other segments. This is due to the increased awareness about safety systems and frequent replacement of electronic components owing to their shorter lifespan and malfunction. The aftermarket segment is anticipated to expand at a significant growth rate during the forecast period. The passenger vehicle segment accounted for a significant share of the market owing to the increasing demand for passenger vehicles globally, primarily for local and intercity transport. In terms of revenue, the passenger vehicle segment held a major share of the lane keep assist system and adaptive cruise control market for automotive in 2016. Studies conducted on the increasing number of road accidents in recent years indicate that accidents such as head collision and side crashes coupled with loss of life have been reduced due to the availability of ADAS such as LKAS and ACC in vehicles. These factors have led to the increase in demand for this combined safety system in the passenger vehicle segment. Europe dominated the global lane keep assist system and adaptive cruise control market for automotive, in 2016. Europe and Asia Pacific are anticipated to dominate the market during the forecast period owing to the rise in awareness about safety systems in the automotive world and increase in adoption of these technologies. This, in turn, clarifies the penetration level in these regions at initial stages, being quite on a higher side than other mass manufacturing regions. The market in Europe is also expected to expand at a significant growth rate owing to safety norms and improved road infrastructure in the region that assists the function of lane keep assist system and adaptive cruise control. The European New Car Assessment Programme consumer testing protocols evaluate the presence of the combined system and offers rewards to manufacturers that incorporate these systems as standard in their vehicles. Safety regulations by the European Union on the automotive industry are also expected to drive the combined system market during the forecast period. Prominent global lane keep assist system and adaptive cruise control market players include Robert Bosch GmbH, Continental AG, Denso Corporation, Valeo, ZF Friedrichshafen Ag, and Delphi Automotive PLC. 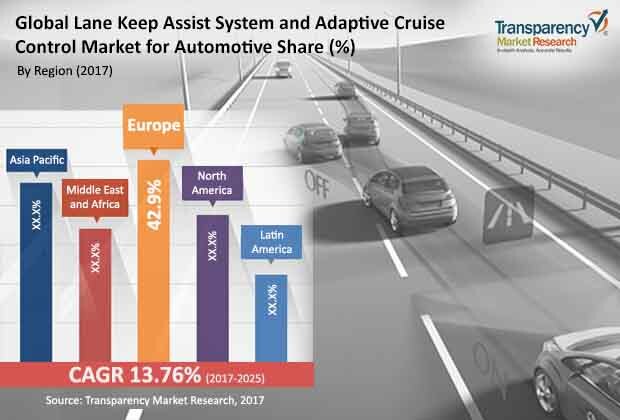 Increasing competition among manufacturers in order to provide better products is likely to boost the lane keep assist system and adaptive cruise control market during the forecast period. Robert Bosch GmbH and Denso Corporation are major suppliers of the lane keep assist system. Benefit from the formation of strategic alliances with regional players and continuous upgrade of technology allows Robert Bosch GmbH to lead the lane keep assist system and adaptive cruise control market for automotive.